This portable, Hide-a-Bar cabinet is finished on all sides and features decorative raised panels on the two front doors and on the back. Four casters allow the cabinet to be easily moved and placed against a wall or in an open setting to be accessed from all sides. 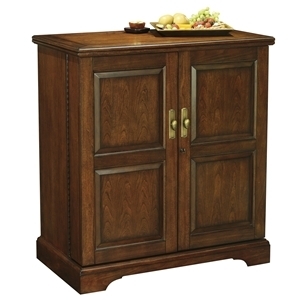 The doors feature distinctive antique brass finished knobs and back plates. 180 degree door hinges allow doors to open wide for easy serving. The top opens up and slides to the left, expanding to 77" and providing increased space for entertaining. An accessory drawer for ample utensil storage features quality dovetail construction with smooth running metal slides. Two adjustable stemware racks can store up to 18 large wine goblets. They also act as a shelf for extra storage. Four adjustable shelves store up to 20 bottles of wine. Each shelf is reversible so that it can be used for alternate storage. Pad-Lock metal shelf clips lock the shelves into place. Continuous holes are included for maximum shelf adjustment. Locking doors for added security.